These are the most chocolaty cookies in the world. 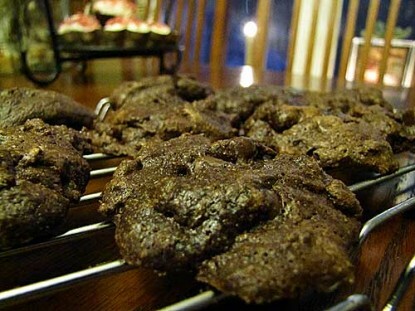 There’s not a lot of flour in them–they are mostly chocolate! Melt HALF of the chocolate chips and all the chocolate squares in a pot. In a medium-size bowl, cream butter and sugar. Stir in melted chocolate. Add vanilla and eggs; mix well. Stir in flour and baking powder. Last, stir in the other half of the chocolate chips. Drop by spoonfuls onto a very lightly greased cookie sheet. Bake at 350-degrees for about 8 minutes or until cookie tops start to crack a little bit.